British Beatles Fan Club: Let It Be Returns! And now the smash-hit stage show has been updated and is back on tour, featuring a brand new Let It Be Part II – which has never been seen before in the UK. Let It Be returns for a UK national tour this Summer and Autumn, before taking to the world stage once again. The updated Let It Be production will be premiered in the UK when it opens at Cardiff’s Wales Millennium Centre on 20 August 2018. The show will then embark on a UK, European and international tour taking countries including Germany and North America. In a twist from the original Let It Be show, audiences will then be taken on a Magical Mystery Tour to experience the concert that never was. Part II of Let It Be is the brand new part of the show, giving audiences the rare opportunity to see The Beatles reunite for one night only, set a decade after the group went their separate ways. 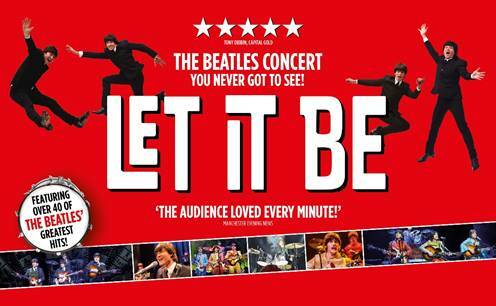 After opening in Cardiff, the updated Let It Be show will then visit Cheltenham, Liverpool, Nottingham, Hull, Edinburgh, Dartford, and Manchester. ...the Liverpool date should coincide with BeatleWeek ...not the week after !